Everything you’ve always wanted to know about tainted food? Well, maybe not everything. Tainted food does, after all, have a long and storied history in China. Ever since the country opened up to foreigners, the stories and scandals have been flying out like cardboard-filled hot buns (more on that later). But let’s get started at the turn of the 20th century, shall we, with yet another of China and Taiwan’s common relations: gutter oil (地沟油). Those delicious youtiao 油条 that I was eating chopped up in my zhou 粥 each morning in Shanghai, or by themselves when I didn’t know any better in Beijing, were deep fried in large vats of oil that bubbled away from the early hours of the morning until around afternoon time, when they were summarily emptied into the streets. But for some lucky vats of oil, their journey doesn’t end there, because rather than lie coagulating in the gutter, they are gathered up by unscrupulous ne’er do wells, sold off for filtration and, ahem, refining, whence they is bottled up again, before finally being resold to unsuspecting food stall owners and restauranteurs. The first case of gutter oil in China was in 2000, when a ‘vendor was caught selling edible oil extracted from restaurant garbage disposals‘, but it took a nationwide scandal to change people’s opinion of it from being isolated incidents to a full blown industry. This happened in Zhejiang province, where police found a small gutter oil processing plant hidden in a copse of trees out in the countryside; this was followed up with police in Shandong and Henan, together with the Zhejiang police, smashing a gutter oil processing network that stretched across 14 provinces. What is shocking is the scale of the operation: the police investigation led to the the gates of Gelin Company, a biodiesel manufacturer in Pingyin County, Jinan, in Shandong Province. Because gutter oil can be distinguished by its pH levels, gangs will add alkalis to combat the abnormally high pH levels of animal fats, as bleach to change the colour. Police in Shandong, whose investigation had led them to the gates of Gelin Company in Pingjin County, in Jilin, sat and watched as trucks filled with contaminant-absorbing clay drove in to the factory compound. When they made arrests, the police seized 694 tons of gutter oil, with the company owner confessing that his company sold 400-550 tons of gutter oil a month, with up to 700-800 at peak times. Gutter oil is often sold as “rice germ” oil, and is also labelled as recognisable brands. It is also blended with pure oil, thus creating an unholy concoction that can be easily sold on. Small and medium sized restaurants that aren’t able to buy oil in bulk are most susceptible to being taken in by scams, though as many of the buyers test the pH of the oil, they are aware that what they’re buying is not wholly legal. It was estimated by a professor at Wuhan Polytechnic University that 1 in 10 meals in China were cooked using gutter oil, a staggering figure that shows how deep the problem runs, and if you judge gutter oil in the context of the other scandals and food related issues in China, it really just becomes another symptom of a malaise in the Chinese food industry. In Taiwan, where the first documented case of gutter oil was in 1985 – a good few years before their brethren across the straits – a number of gutter oil scandals broke out in 2014, when Chang Guann, a supplier of edible oil in Kaohsiung, the second largest city in Taiwan, had been found to have used 240 tonnes of gutter oil to produce 780 tonnes of edible lard oil. 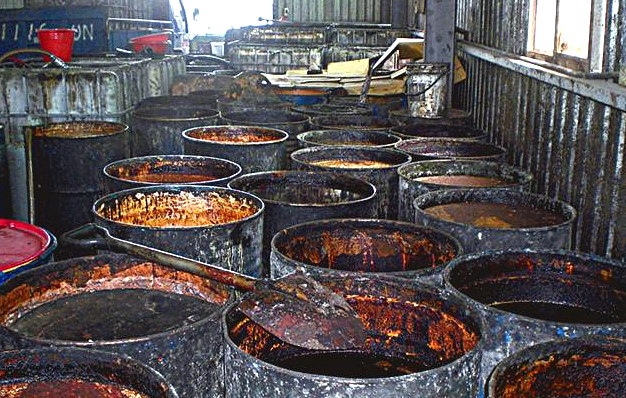 The food and oil products of some 235 food companies suspected to have used the contaminated oil were taken off the shelves around Taiwan, and arrests were made at both Chang Guann and the unlicensed factory in Pingtung, from where the gutter oil was originally bought. This was followed by Ting Hsin International Group being investigated for the alleged sale of gutter oil, through their unit Chang-I Food Company, which had an 80% share of the lard oil market in Taiwan. But even such a dominant position couldn’t save them, as Ting Hsin pulled out of the oil market altogether, and donated TW$3bn to food safety as some way of recompense. As a result of the first scandal, Chang Guann were fined TW$50m (around £1m), and Qiu Wen Ta, the Minister of Health and Welfare, fell on his sword and resigned from office as a matter of political responsibility. The response was a call for better screening on the behalf of Taiwanese food companies, and for onsite inspections of their suppliers’s facilities. The Taiwanese Industrial Development Bureau planned to implement a monitoring system to trace the sources of raw materials and check the quality of all finished processed food products in order prevent similar incidents in the future. Gutter oil is just the tip of a particularly unpleasant fatberg that floats almost unencumbered through the Chinese and East Asian food industries. And speaking of floating, it’s not every day that you get to see dead pigs drifting down the Huangpu river (which supplies drinking water to the people of Shanghai, all 23.9 million of them), but in March 2013 that is exactly what you would have seen: up to 16,000 of them, to be precise, after they were dumped there by illegal pork dealers. There was a gap in the market, it seemed, for groups of these pork dealers to buy up meat unfit for sale, process it illegally, and pushing it into the legal market. 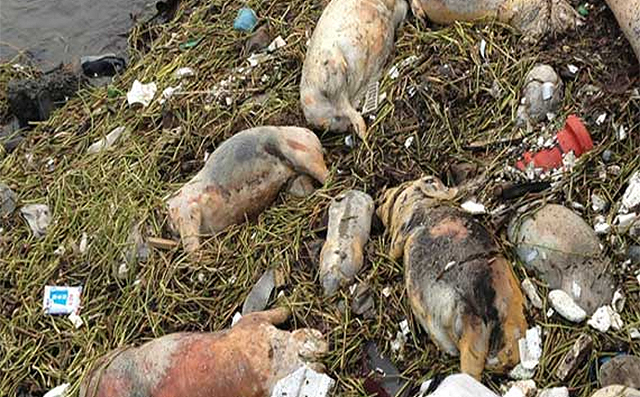 Apparently there was a crackdown on on the Zhejiang pig-trade, the dealers got nervous, and the farmers who were selling them the dead animals simply dumped their wares, much like dealers flushing their drugs down the toilet when the police come a-knocking. Over in Xi’an 西安 in Shaanxi province 陕西省, and way back in 2013, there was another scam that hit the headlines, and one that I remember being described as “painted meat.” Beef being a more expensive commodity than pork, and Xi’an having a large Muslim community, having access to cheap beef – and lots of it – would be something of a comparative advantage; and it turned out that someone did indeed have access to a lot of cheap beef, beef that was in fact so cheap that it was actually pork. You see, said beef was being “faked” in a strange and unpleasant way: pork was treated with chemicals such as paraffin wax and industrial salts, to give it the appearance of beef, and then sold on. Police raids at 6 workshops netted over 20,000kg of the stuff, which was destined for the markets and restaurants of Xi’an, and goes to show the depths which criminal elements will happily plumb in the name of a quick buck. So, finally, back to those cardboard-filled buns. Happily, this was a hoax from 2007, which resulted in the reporter from BTV 7 who made it up, Zi Beijia, being jailed and fined. He had even gone to the trouble of hiring migrant workers to be filmed filling buns with cardboard, an impressive commitment to falsifying a story. Yet in the light of other scandals it does not seem so outlandish. This is, after all, a country where watermelons explode from being fed too many chemicals, and where sewage has been used in the production of stinky tofu (though some might say that it always has been). Irrespective of whether or not Deng Xiao Ping actually said “to get rich is glorious” (致富光荣), he probably never envisaged such sentiments being taken to their extreme through the cynical and corrupt practices that have lined the pockets of criminals in gangs and boardrooms across the country. But it is this sentiment, coupled with the lack of oversight and the corruption that pervades officialdom and government bodies within China, that has led to food safety standards being at such poor levels: the drive to push from agrarian society to developing nation has seen those old habits of money-at-any-cost continue. Cutting corners in order to make money, and doing so wilfully, has affected the most vulnerable in society, and a comprehensive regulatory framework needs to be put in place. In 2014, the Chinese State Food and Drug Administration received 438,673 complaints about food safety and other food-related issues, they stated. The total number of complaints they received last year was double that of 2013, which shows that the issues are not going away, and that Chinese consumers are more aware of problems and the procedures necessary to register complaints. If it is money that the food companies and their suppliers care about, then it seems that Chinese consumers will do the job of the government for them, which is an empowering stance.